Dr. Rhonda Y. Williams will be the 11th Annual Anne Braden Memorial lecturer. 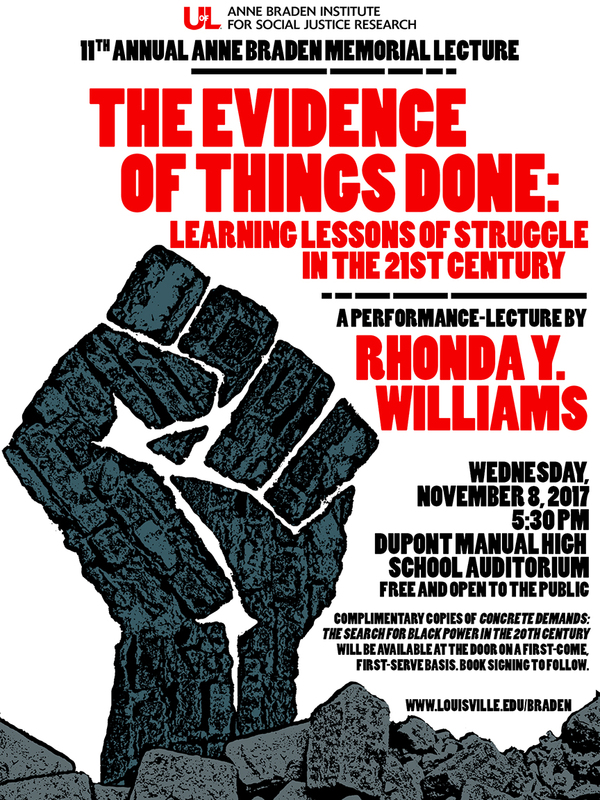 Williams will deliver the performance-lecture "The Evidence of Things Done: Learning Lessons of Struggle in the 21st Century." Dr. Williams, a historian and the Inaugural Director of the Social Justice Institute at Case Western Reserve, is currently John L. Seigenthaler Chair in American History at Vanderbilt University. She is the author of Concrete Demands: The Search for Black Power in the 20th Century and The Politics of Public Housing: Black Women's Struggles Against Urban Inequality. Her research focuses on low-income black women’s and marginalized people’s experiences, everyday lives, politics, and social struggles; and that research contributes to the rethinking of gender, political identity, citizenship, civil rights, black liberation struggles, and interactions with the U.S. state. A limited number of copies of Dr. Williams’s book Concrete Demands: The Search for Black Power in the 20th Century will be given out at the door on a first-come, first-served basis. Book signing to follow. As always, this event is free and open to the public. Download a copy of the lecture flyer here. Facebook event page here.